The perfect NBA Finals ending will take place in a Game 7, making it 107 consecutive games played for LeBron James this season. He will log 48 minutes in Game 7 and then another five in overtime before the 2017-18 championship is decided. LeBron will record a triple-double and on the stage with confetti falling from the rafters NBA Commissioner Adam Silver will hand the game’s all-time greatest player both the MVP award and the Larry O’Brien trophy. Now that’s the appropriate conclusion to an incredible playoff run for the self-proclaimed King. Reality, however, says Golden State in 5. As much as you want to build a case for LeBron and the Cleveland Cavaliers to pull off the monumental upset it’s hard to imagine the Warriors not winning a second straight championship and beating the Cavs for the third time in four years. If James wins four more games it’s hard to argue otherwise. LeBron has reached the NBA Finals a remarkable eight straight years and this postseason he’s done his best work with a mediocre supporting case. He’s averaging 34 points in 18 playoff games and absolutely willed Cleveland to wins in Games 6 & 7 against the Boston Celtics. For a simple reference point, consider that Dwyane Wade and Carmelo Anthony both entered the league with LeBron in 2003. Wade is considering retirement and Melo is fighting the next logical step in his career; moving to the bench. The player selected second overall, Darko Milicic, has been living on a farm in Serbia the last five years. LeBron? At 33 he’s still the league’s most dominant player. He’s played in 235 career playoff games or 56 more than Michael Jordan. A loss would put LeBron’s record at 3-6 in the Finals but he’s been the underdog in seven of them. Jordan is still a notch above but four wins changes all that. If Draymond Green doesn’t foolishly get himself suspended for Game 5 in 2016 with the Warriors leading the Cavs 3-1 we would be looking at Golden State closing in on a fourth straight championship. But another title — three in four years — places them in select company in the modern era. The Jordan Bulls three-peated twice in the 90’s while the Lakers ran off three straight with Shaquille O’Neal and Kobe Bryant starting in 2000. In the late 60’s the Celtics won three out of four years. This season hasn’t been easy for Golden State. Like Cleveland, they had to win the last two games of their conference finals to advance, including a Game 7 on the road. Stephen Curry appeared in just 51 games during the regular season and missed the first six of the playoffs while recovering from a knee injury. Sure, they’ve gotten a little arrogant over the years, which is only natural. But don’t kid yourself. This is an all-time great club. Their place in history will be confirmed in June. 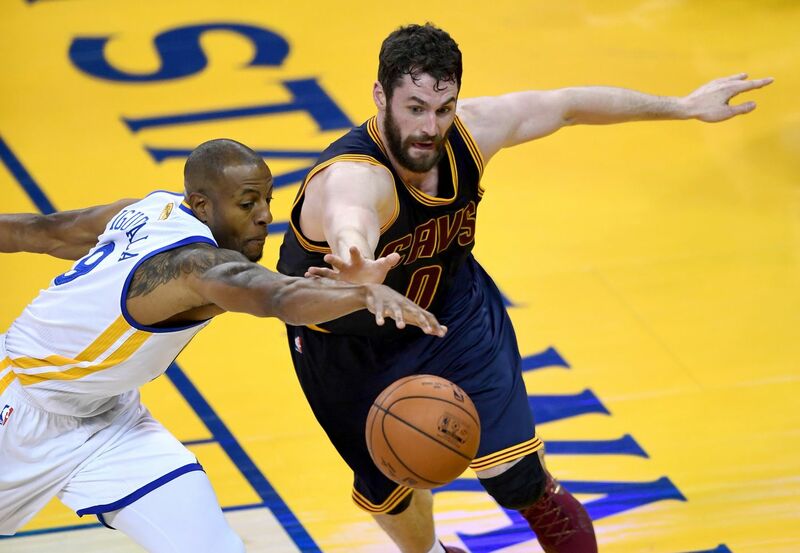 The Cavs arrived in the Bay Area late Tuesday unsure if Love, who is in concussion protocol, will be available for Game 1. Love, injured in the first quarter of Game 6 against the Celtics, did not play in Game 7 His replacement, Jeff Green, scored 19 in the win but Cleveland needs the All-Star power forward to have any chance of winning. Iguodala, the 2015 Finals MVP, has missed the past four games with a knee injury and there’s a growing belief that he could miss at least the first two games of the Finals. Both can become free agents on July 1st with the understanding they could sign more lucrative deals with their current teams. Staying in the East makes the most sense for LeBron, who absolutely owns the conference. But the theory of LeBron moving to Los Angeles or perhaps Houston is very much in play. Durant, according to a source, might be open to listening to other teams but why ruin the once-in-a-lifetime situation in Golden State. He’s four wins away from back-to-back titles and the Warriors will enter next season as the favorite to three-peat. If LeBron stays and Durant stays we could get Warriors-Cavs for a fifth time next year. You may not want that but the television ratings disagree.